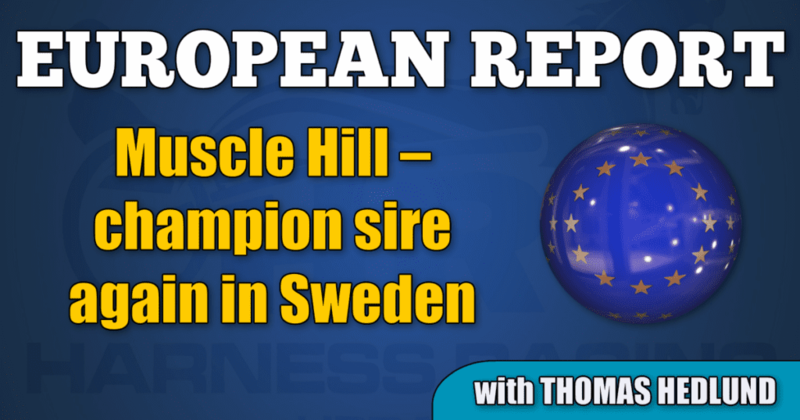 Swedish harness racing magazine Sulkysport (sulkysport.se) recently published statistics regarding the European stallions for 2018 and Muscle Hill dominated strongly in Sweden last year. Propulsion (Muscle Hill—Danae) had a tremendous year on the tracks in 2018 and collected more than $1,214,000 during the season. That, and the fact that Björn Goop’s Mellby Free (Muscle Hill—Mellby Ticket) earned more than $675,000, were major contributing factors for the success of Muscle Hill as a stallion. Muscle Hill offspring made 1,306 starts and won 258 races for total earnings of $5,707,349, which is a new record for a single stallion in Sweden. One reason for the new record is the increasing purses in Sweden last year, which were 18 per cent higher than the previous year. Ready Cash and Maharajah fought a tight struggle and followed behind Muscle Hill on the Swedish list. Ready Cash’s dominance as stallion in French harness racing is unsurpassed for the moment. His offspring, both sulky and under saddle, earned a phenomenal $12,618,047. For the third consecutive year, Ready Cash dominated the French stallion stats. Forty-one times his offspring won races with purses higher than 100,000 euro ($114,300). Swedish-bred Readly Express won the 2018 Prix d’Amérique, Bold Eagle finished second and the list of victories from prestigious races in France where Ready Cash is the proud father is long. Bird Parker won Prix de Paris ($457,000) and Prix de Belgigue ($135,000), Traders won Prix de Cornulier ($800,126) under saddle and Face Time Bourbon and Eridan won two of the Criterium-races ($274,328) during 2018. Bold Eagle earned $921,288 in 2018 and, by that measure, was the best harness horse in France last year. Ready Cash can easily continue to dominate French breeding in the years ahead since he also produced the 2-year-old trotter with highest earnings last season. Now 3-year-old Gotland (Ready Cash—Sanawa) had five starts, won them all and earned $184,029. Prodigious and Love You entered the podium behind the outstanding Ready Cash. In the opinion of many harness racing fans, the best trotter in the world is Varenne and the champion on the tracks also leaves his impression in Italian breeding. In 2018, Varenne took his ninth stallion championship in his home country. His offspring earned $4,869,431, combined, in 2018. Andover Hall was the most successful stallion in Finland, Revenue was tops in Norway and Great Challenger led the pack in Denmark. Four-year-old Face Time Bourbon (Ready Cash—Vita Bourbon) has dominated the races in the F-crop in France so far and the son of Ready Cash was impossible to stop when he won the $120,000 Prix Charles Tiercelin in a new stakes and track record at Vincennes last Sunday on the Prix d’Amerique card. Björn Goop drove the Sébastien Guarato trained 4-year-old and the duo had no bigger problems to secure the victory in mid home stretch, after a third-over trip and an attack three wide with a little less than a half mile to go. The mile rate of 1:54.3 over 1.3 miles is a new track record for 4-year-olds at Vincennes and the temperature around the Ready Cash son is rising, not only because his performances at the track, but also due to the big interest for his future breeding services. At Arqana Trot’s sale at Vincennes on Friday, Jan. 25, a 1/90-part of Face Time Bourbon’s services as a stud was sold for 110,000 euros, approximately $125,000 and for the moment, this trotter seems to be hard value in the European trotting business.